A teaser for a cinematic trailer of the Open Jedi Project: Enhanced mod for Jedi Academy is now available! The OJP:Enhanced community has been hard at work in producing media content to show what the mod is capable of. The full cinematic trailer will be out by the end of the month and will hint at a story that will hopefully become an OJP CoOp campaign. Teaser #1 focuses on the dynamic, fast-paced lightsaber combat in the Enhanced saber system. In this one-minute teaser you will see the duelists truly in control of their lightsabers and use regular attacks, quick lock-inducing power attacks, automatic blocks, directional parries, and acrobatics. 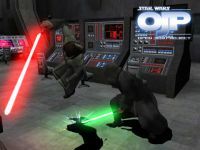 You will see the fast and tactical saber combat that OJP:Enhanced gameplay is currently capable of at v0.0.9u and is constantly improving on. The teaser features Jon Hockney as Isaias (Jedi with green saber) and JackBaldy as Sagar (Dark Jedi with red saber). Isaias and Sagar skins belong to Brejo "Slaughter" Savet. Imperial Time Machine map belongs to Nozyspy. DOWNLOAD 640x480 AVI here from the OJP:Enhanced ModDB page! doesn't really look to the viewer that they're doing all those things you mentioned. Guess you gotta play it. Haha awesome. Going to download it now! Get that co-op done! Thanks for downloading! Unfortunately a new Co-Op campaign will have to wait until we finish the major features of the OJP:Enhanced mod. If the major features aren't completed we won't know what we can incorporate into a Co-Op campaign. Plus we'll need additional mappers, modelers and skinners in order for a new Co-Op campaign to truly get underway. But here's a hint for the campaign idea: you're on the run from the Empire, but you're not the only one. I can point them out for you - Blocks are two-handed. Parries are one-handed and look like you're batting the enemy saber away. Power attacks that aren't parried result in those two saberlocks that you see in the middle and at the end. You'll notice that they're slower to execute because they start in one direction but end up in another (old OJP vets call them "attack fakes" for that very reason). At the very end, you can see that Sagar hit with a low left, brought up the saber to hit a high diagonal, but brought it down to a low left again for a swing - that's one of the more obvious power attacks in the video. It doesn't allow you to control when you parry and when you saberlock, either. OJP's gameplay can't really be shown much by screenshots, you'd have to watch the trailer or play the actual game.